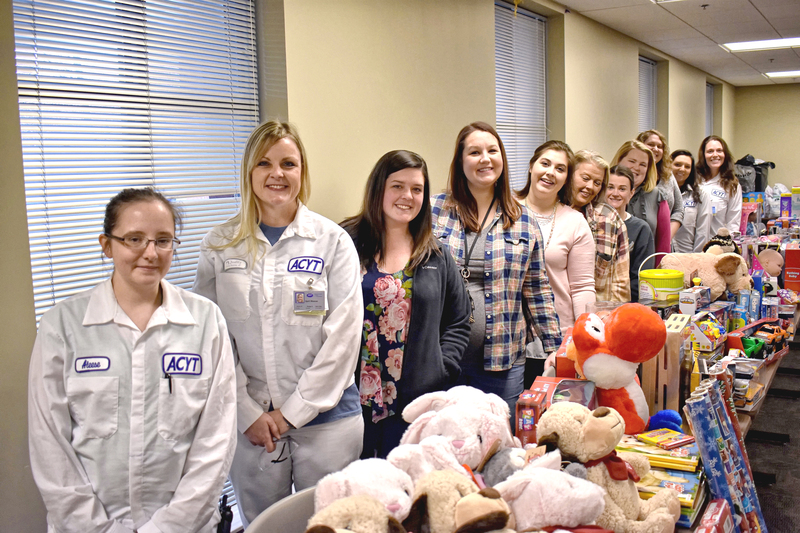 CULLMAN – On Monday morning, the Cullman County Department of Human Resources (DHR) received a much-needed gift (a roomful of them, in fact!) from Alabama Cullman Yutaka Technologies (ACYT), as part of an ongoing partnership between company employees and the agency this year. Yutaka’s Summer Breskow Perry told The Tribune, “Each year we try to sponsor local organizations. At Yutaka, we have what we call the ‘A Team;’ we take care of all activities in the community. We got together and we voted, and decided to sponsor three organizations this year: DHR, Good Samaritan Health Clinic and Hanceville Nursing Home. Perry said Yutaka just really wants to help people in the community. Yutaka’s staff sponsored 68 kids, and other community groups and individuals are serving as sponsors, as well. The company gave certain gifts specifically to their sponsored kids, and a great many more gifts to be distributed by DHR as needs and opportunities arise. Cullman DHR currently has 265 children in foster care; a few of whom, including kids up to 7 years old, will be receiving their very first Christmas presents this year. Smith said the department has received help this holiday season from many community sponsors, including: Yutaka, Kids to Love, Desperation Church, The Cullman Realtors Association, Second Century League, Holly Pond High School, other various local churches, civic groups and individuals throughout the community. “The department just does not have the resources available to make Christmas happen for our families without such generosity from the community,” she shared. To find out how you can help DHR’s foster children, call the Cullman office at 256-737-5300.